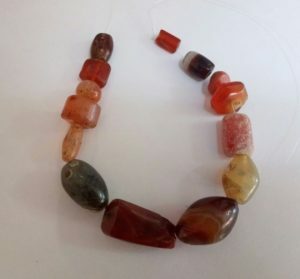 This research deals with the common gemstones in the area of ​​the Land of Israel and its surroundings, in light of historical sources and rich archaeological finds. The research focuses on the identification of the stones of the priestly breastplate – the largest and most concentrated collection mentioned in the Bible, representing the most important and prestigious gemstones of the ancient world. The study was published in the book “החן שבאבן” and it systematically and comprehensively reviews most of the identifications of the stones of the breastplate, from ancient translations through medieval commentators to modern scholars. The various interpretations reflect the changes that have taken place in the gemstone industry over the ages, and thus, this book becomes the history of the gemstones. Following the author’s previous studies, such as in the book “צמחי המקרא [Plants of the Bible],” the identification of the stones of the breastplate was re-examined in the light of traditional interpretation and modern research tools. The contribution of this study is, among other things, the presentation of a new methodological method that enables the examination of all data and interpretations and a sound investigation of their probability in a logical and historical context. The gemstone study includes various other issues, such as: the origin of gemstones, the belief in the medicinal and magical properties of the stones and the attitude of Judaism towards it, the methods of processing and engraving gems, identifying the ‘shamir’, and more. For the first time in Israel and perhaps in the world, a dedicated laboratory for archaeological gemology was established in the Department of Land of Israel Studies and Archeology at Bar-Ilan University. This is a new field of research in cooperation with Ms. Yael Elkayam, a graduate in gemology. For the research, a laboratory was established with sophisticated equipment that enables the absolute analytical identification of the stones found in archaeological excavations. To date, dozens of stones have been examined from various sites. Among the research team’s first studies is the identification of gemstones found as part of the Temple Mount dust screening project and their significance, and minerals used for cosmetics found in one of the Judean Desert caves (in press).